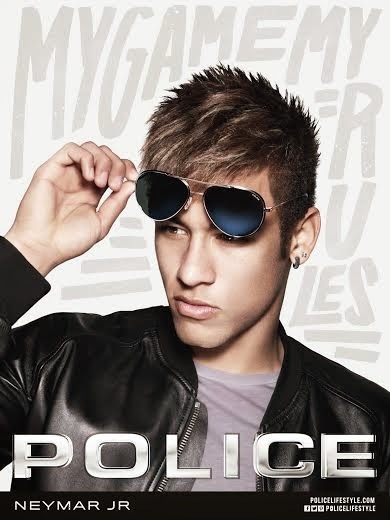 The new hope of international football and budding style icon Neymar Jr is the new face of the Police advertising campaign this 2014. Shot by globally renowned fashion photographer, Rankin, the new Police campaign portrays Neymar da Silva Santos Júnior (known as Neymar Jr) in a number of minimalist shots with an urban finish; enhancing the style of the talented Brazilian footballer. According to reports, there will be plenty of international focus on Neymar in 2014, as his club FC Barcelona continues their assault on the UEFA Champion's League, and his home country hosts the FIFA World Cup 2014. "The 2014 Police eyewear collection combines the brand's traditional hallmarks with modern finishes. The bold and contemporary design of the Sun and Optical ranges adhere to the brand’s strong identity and urban roots. ", the eyewear brand promoter said. “Neymar expresses the various nuances of the brand’s style and interprets them with passion and personality,” enthused Michele Aracri, CEO of the De Rigo Vision Spa. Mexican model Daniela De Jesus is the female protagonist of the new campaign, portrayed alongside Neymar Jr showcasing the women’s offering from the brand. The Brazilian icon is following in footsteps filled with plenty of footballing pedigree; British soccer star David Beckham was a previous face of the company.